Well… Dave is the owner and head chef at Southern New England’s roadside landmark the KP Diner. For over 20 years Dave has been greeting everyone whose stopped by and enjoyed his good down home cooking on Rt 44 in Rehoboth, Massachusetts. As you can tell by now Dave is a little sassy! And it’s that sassy nature of Dave’s that helped him to create one of the most talked about dressings in his community. Well, Dave was told if you could bottle this stuff it would be great to take home! Dave agreed and created Dave’s Original Sauce. His customers enjoyed the unique taste of Dave’s Original Sauce on a variety of home cooked meals. 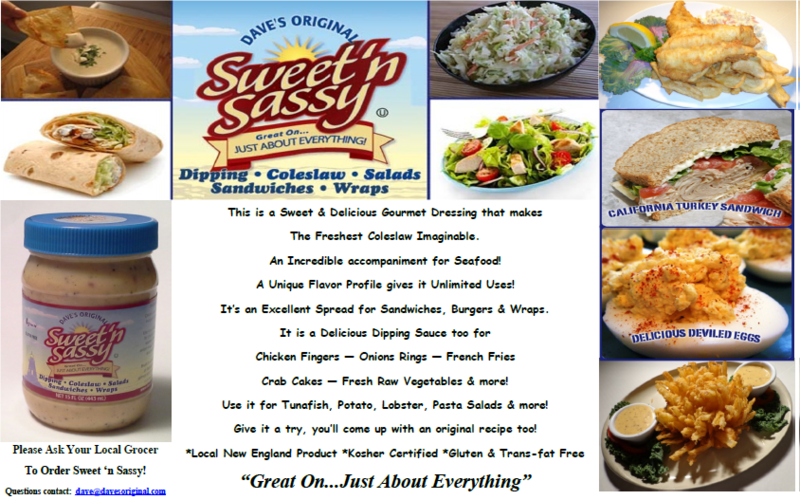 Dave now has a great new addition to his saucy line up, its DAVE’S ORIGINAL SWEET n’ SASSY which is being introduced in stores RIGHT NOW!!! So come on out to the KP Diner and tell Dave you saw him on his website! Ms. Carol Strong, South Windsor. Ct.